Welcome to the JVNP 2.0 Weekend Update featuring a primary JV request courtesy of fellow JVNP 2.0 Partner Alex Jeffreys (Digital Product Machine – digital product creation and marketing system – JVZoo affiliate program JV invite), Buzz Builders (Anton Nadilo + Jon Shawcross – SEO Enigma Reloaded launch) and More … in Today’s soup to nuts digital product creation & marketing edition. Since 2006 I’ve built a 7 figure per year online business with a dead simple business model. We create and sell information products – and we teach other people to do the same. Over the years I’ve worked or coached THOUSANDS of people in niches as varied as dancing, videography, hypnosis, forex, tennis, golf, dog training and NLP. So I’m not bragging when I say you’d be hard pressed to find someone with more personal success stories on Warrior Forum. Today I’m proud to announce another EARTH SHATTERING product launch. With 100% commissions throughout the ENTIRE funnel. It’s called The Digital Product Machine. 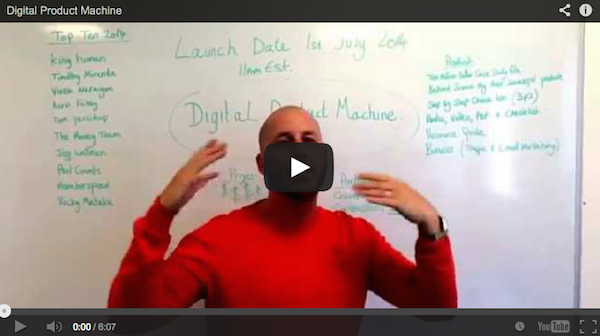 It’s a series of 6 video training modules – outlining my entire digital product creation and marketing system. Everything from coming up with a killer idea, to getting affiliates to drive free traffic to your finished offer. That’s right 100% Through the WHOLE Funnel. That’s a $53.95 sale with $27 of recurring income. And since this launch is powered by JVZoo, those commissions are instant. So you won’t have to wait around to get paid. Now I know you’re wondering about our launch prizes. I’m happy to say they’re bigger than anything we’ve ever done before. First Place – 52” Plasma TV – $1000 value. Second Place – Apple iPad Air – $500 value. Third Place – Beats by Dre Wireless – $250 value. We also have more cash prizes all the way down to 10th place. And that’s all before our daily cash prizes for our best performers each and every day of the launch. Plus, all sales of the Digital Product Machine will count toward our year long 2014 JV Competition. Even if you only make one sale – you’re automatically in the running. We’re only 6 months into the year, and we’ve got lots of other launches coming. So even if you’ve just entered the race, you can still place or win. First Place – a luxury holiday in the Caribbean for 2, worth $10,000. Second Place – 2 tickets to the Marketers Cruise with Mike Filsaime, worth $3,000. Third Place – a spa getaway for 2 worth over $1,000. Fourth Place – a Swiss watch worth over $500. Fifth Place – an iPad Air worth $250. You definitely want in on that action. Getting involved is easy. All you have to do is sign up, and grab your affiliate link. We’ve got email swipes and banner ads for you on the JV page. Everything you need to make this launch a personal success – not just for me, but for you too. Video Secrets Unleashed New for 2014 – A brand new product by Matt Bacak and Mike Stewart, The Internet Audio & Video Guy. Request your link right now so you can promote this hot new offer to your list and enjoy paypal commissions (JV Page link below). Ben Shaffer, Chris Carpenter, Mark Roth, BJ Min, Josh Ratta, Anik Singal, Georgi Georgiev, Josh Bartlett, Bryan Winters, John Pearce, Christian Fea, Greg Jacobs, Matt Wolfe and other fellow JVNotifyPro 2.0 partners are waiting in the wings … keep your eyes on your Inbox, and follow the action in the JVNP 2.0 Premium VIP JV Announcement archives.